Posted February 4th, 2019 & filed under News. 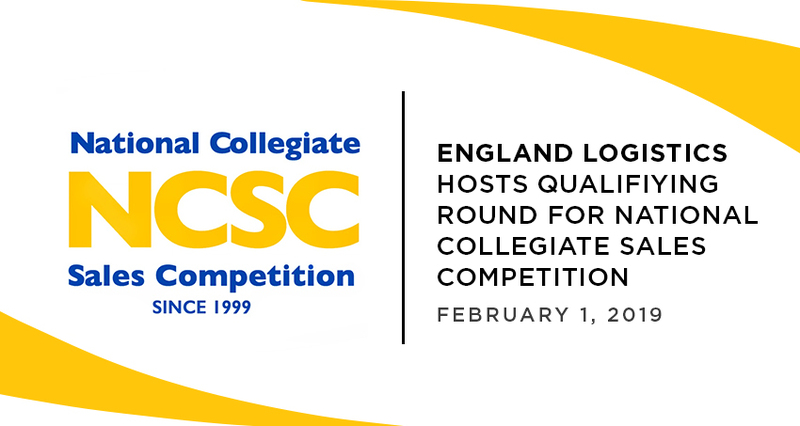 SALT LAKE CITY, Utah, February 4, 2019 – England Logistics, one of the nation’s top freight brokerage firms, hosted the 2019 Road to National Collegiate Sales Competition (NCSC) at Weber State University (WSU) on Friday, February 1. The top seven finalists received $1,000 in tuition reimbursement and a sponsored trip to the NCSC competition at Kennesaw State University courtesy of England Logistics. The top two finalists will go on to represent WSU at the NCSC at Kennesaw State University. England Logistics offers a vast portfolio of non-asset based transportation solutions including full truckload services, intermodal, dry and cold chain LTL, parcel, global logistics, and complete supply chain management. England Logistics is an equal opportunity employer offering competitive national and international opportunities to qualified candidates. Headquartered in Salt Lake City, Utah, the company also has offices in Ogden, Utah; Atlanta, Georgia; Detroit, Michigan; Greeley, Colorado; and Portland, Oregon. To become part of England Logistics’ freight agent team call 866-476-7012 or visit http://www.englandlogistics.com.